Pumpkin Pie Dip – creamy and full of pumpkin spice flavor. Eat this Pumpkin Pie Dip with graham cracker sticks to taste just like pumpkin pie. I did not escape the wrath of whatever my boys had. It hit me like a ton of bricks and I alternated between shivering and sweating to death. I think it was the flu. Whatever it was, at least it was a short lived torture because so much is going on this time of year. If you guys are anything like me, you are swamped with birthday parties, Halloween parties, and school functions. This dip is great for a Halloween party. 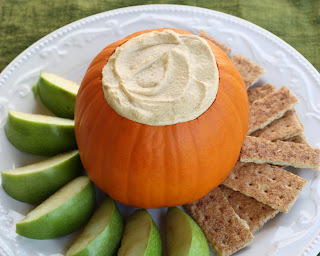 If you love Pumpkin Pie, you will love this dip. I know I have posted this Pumpkin Fluff Dip before, and while it’s good, I prefer the texture and taste of this one. Fold in the thawed whipped cream. I sprinkled a bit of cinnamon on top for a nice presentation. Served it at work and at a party at our house last fall – everyone raved over it, and multiple folks wanted the recipe. Served it in a pumpkin just like the picture. Great, easy dip that’s perfect for Fall. I’ve made this dip before…my brother-in-law called it AMAZING! 🙂 Pumpkin is so versatile…who knew?! Yay, finally the perfect blog on this topic thank you so much. This is soooo dangerous. who needs apples or gingersnaps- just give me the spoon. I’ve made it a few times in the past month and everyone I know is now making it for their parties. I found this over on the ridiculously popular pinterest! The fluff dip (first link) looks super delicious and I can’t wait to take it to a military spouse group I’m in! I clicked the link to go to the second dip and the website said there was an error finding it. Could you e-mail it to me or is it somewhere else on your blog? I’d love to compare since you say you prefer it! Oh my goodness.. I had the SAME sickness, I am still sick and I think I am beginning to get better… finally! Being sick and a mom just does not go together-so sorry for you:) This sounds like the one I make-so yummy! So sorry to hear you’ve been under the weather. I’ve been sick too. Its just no fun 🙁 But I do believe your wonderful pumpkin dip could put me on the road to recovery!! Sorry to hear you were under the weather! We too have had this sweep through our house. I think we’re all on the mend now. Sounds delicious! I’m a little weirded out that apples are dipped in it, but I’m sure it tastes fantastic. If anyone ends up making this I would love to know what you dipped in it. I’ll probably end up making it for Thanksgiving so i’m in no hurry to find out. ugh, sorry you got sick too! Getting sick when your so busy is the worst! I have a TON to do this week and I feel a cold coming on (luckily, not the flu, that’s definitely worse)! This recipe looks amazing, I’m hosting a Halloween party on Friday, I think I’ll add it to my menu! YUMMO!